As pioneers of commercial electronic distribution products, SAC Electronics is the UK’s largest TV aerial bracket manufacturer. SAC supplies wholesalers and traders across the UK and Europe, priding themselves on their industry best 99.8% average stock holding figure. The marketing team at SAC wanted to reach a wider customer base with offers and product discounts through multi-channel campaigns. It was important to maximise on the potential of each discounted product by promoting the unmissable offers across as many platforms as possible. Though the team hadn’t previously used SMS, they found that the channel offered an instant yet cost effective way to connect with their customers that was also trackable for reporting on results. SAC electronics used SMS to launch bi weekly offers, sharing the latest discounts and product offers with 300-400 customers. Using the ‘deal of the week’ offers, often the mentioned product would sell out within a few minutes of sending. 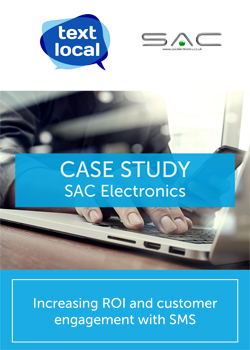 Overall, using SMS has helped SAC Electronics increase sales by sharing timed offers with larger groups of contacts in real time. By integrating SMS in to their multi-channel marketing, SAC benefited from a greater return on investment and customer engagement. Textlocal have been a GREAT asset to our weekly campaigns and on top of that, their services have made me look rather good.